Flowers and colors may vary due to availability. 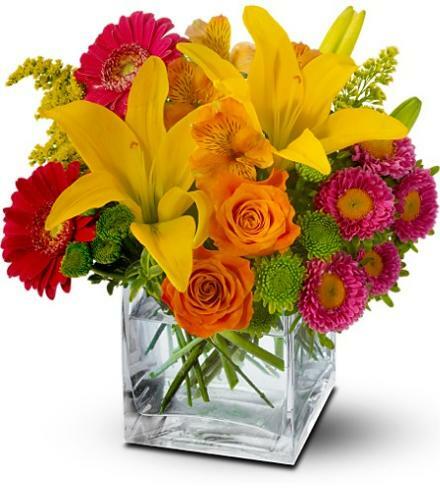 Send a flower splash with this pop art mix of yellow, pink, orange and green floral blossoms, arranged in a modern glass cube vase – and bring some fun to someone’s day. Flowers may vary due to regional local availability. . Celebrate Fall with the Color Splash Time Bouquet. Florist Notes: Add a large card, a teddy bear, a box of chocolates and some helium balloons. Your gift will make an even bigger splash. Flowers/colors may vary. Order early Allow flowers to be ordered from grower. Arrangement Details: Orange roses and alstroemeria, yellow Asiatic lilies, pink Matsumoto asters, pink miniature gerberas and green button spray chrysanthemums – accented with oregonia and solidaster.